Have you always dreamed of becoming a Hollywood star? Now’s your chance! Putt your way through the 18 steps of becoming a star as your agent, Marty McBooster, provides you with witty words of advice along the way. 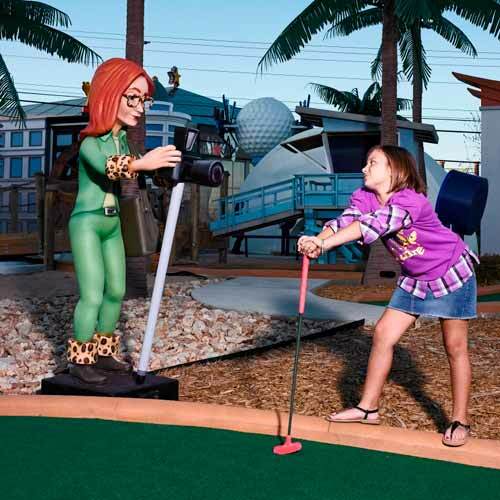 Great for all ages, this mini-golf course is 18-holes of fun, celebrity status, and even paparazzi. Be on the lookout for Hollywood landmarks throughout your 18-step journey to stardom. Putt Your Way to Fame! Experience the famous landmarks of Hollywood as you take the 18 steps to becoming a star. From Being Discovered to earning your very own star on Hollywood Boulevard, your wisecracking agent, Marty McBooster, guides your journey past Grauman's Chinese Theatre, Capitol Records, the Hollywood Bowl, and more, with hilarious words of advice at each hole. You’ll putt through palm trees and parties, as your hairdresser charges $600 for a coif and your limo driver carries your bags on Rodeo Drive. Of course, on your journey to stardom, not every step is a "hole in one". As tabloid headlines threaten and charity brunches loom, Marty talks you through auditions, talk shows, awards ceremonies, and more. Tons of exciting photo opportunities along the way. 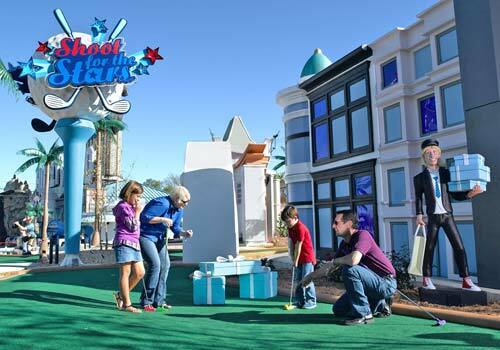 Enjoy a final tally of your Star Status at the Star-O-Meter, determined by your last putt. Modeled after Hollywood’s art deco Crossroads of the World with its famous spire, the Star-O-Meter lights up higher and higher on the spire to show your ranking, from one star (Overexposed) to four stars (Legendary). Twenty-four shooting stars, 8,000 animated LEDs and coordinated sound effects are used to create the spectacular finish. Fun for all ages is par for the course! Does this attraction have an age limit? 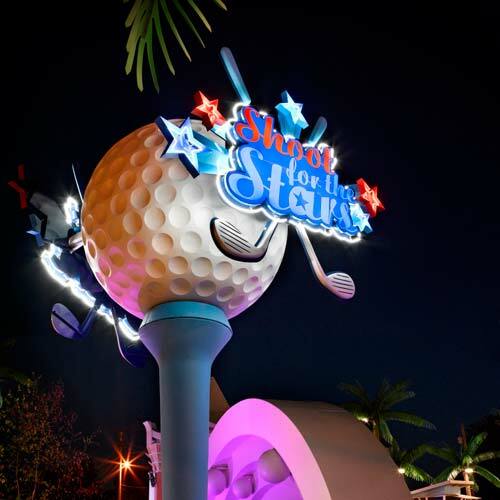 Guests of all ages can enjoy Shoot for the Stars Mini-Golf! How many holes are on the course? 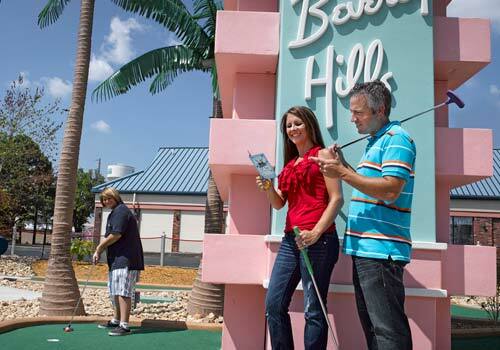 This mini golf course includes 18 holes of fun for the whole family. 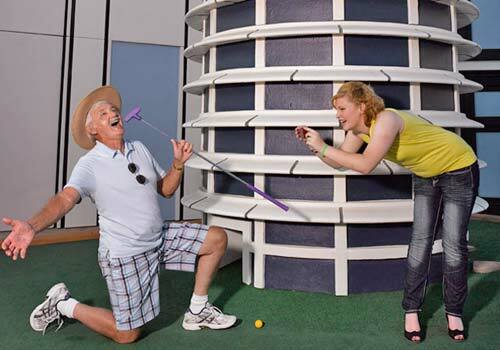 Shoot for the Stars Mini-Golf is located in the Hollywood Wax Museum Entertainment Center at 3030 West 76 Country Blvd, Branson, MO 65616.